Where a banyan tree is adventitious, with its branches and roots growing in a promiscuous tangle, from unincorporated territory [lukao] by Craig Santos Perez is ordered and carefully wrought. Beyond this initial comparison however, Perez deploys the banyan tree as both metaphor and symbol of two interrelated political pairings: colonisation/decolonisation and militarisation/demilitarisation. The book pivots on the tension between these two pairings, and on another dichotomy: birth/death. Perez rarely uses language for singular meaning: "archipelago," for example, refers to the Mariana Archipelago of Micronesia in the western Pacific, and to the project of Chamorro self-sovereignty. Chamorro are the indigenous people of Guåhan (Guam) and the Mariana Archipelago. (Perez is Chamorro but grew up in San Francisco from the age of fifteen; he currently teaches at the University of Hawai'i.) In the above passage, "i trunkun nunu : the giant banyan tree" symbolises the project of remaking Guåhan into a place where "i taotaomo'na : the spirits of before" can once again dwell. The proliferation of the banyan tree into an archipelago is a metaphor of Chamorro self-sovereignty. As such the project necessarily invokes colonisation/decolonisation, militarisation/demilitarisation, and birth/death. from unincorporated territory [lukao] is anti-colonial, as the title makes clear. Guåhan is an unincorporated territory of the United States. This designation entitles Guamanians to American citizenship but not the right to vote. Their island is used primarily as a military base for the U.S army. It is from this colonised, militarised position that Perez situates his anti-colonial/anti-militarisation suite of work. from unincorporated territory [lukao] is preceded by 2008's from unincorporated territory [hacha], 2010's from unincorporated territory [saina], and 2014's from unincorporated territory [guma']. Each collection is a branch, an aerial root of a giant banyan tree on its way to becoming an archipelago of self-sovereignty. 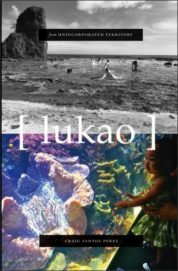 [lukao] means procession, a thematic that enables Perez to encompass Chamorro creation stories of Guåhan's origins; reflections on the chain of nations who have colonised Guåhan (Spain, Japan, U.S); his own familial history; religious rites; and the birth of his daughter Kaikainali'i (addressed as "[neni]"). These themes are distributed throughout the four main sections of from unincorporated territory [lukao] under five titles (one of which has five subtitles). This distribution enables variant iterations and repetitions of words, phrases, and typographic strategies such as: double forward and backward slash (\\ //); square brackets ([you] refers to Brandy Nālani, Perez' wife); faded type (for extinct birds); strikethrough text (for banned Chamorro birthing practices); italicised text (English translation of Chamorro words); colon with a space on either side, as in "i trunkun nunu : the giant banyan tree" (perhaps to give equal weight to the two languages); ~~~ as separatory devices, and # to indicate both digital saturation and recent (and on-going) political movements such as #blacklivesmatter. "kaaa-ah o asaina kaaa-ah o aniti"
This entry was posted in Uncategorized and tagged Winter 2017 on February 16, 2018 by Kelly.